Since Scouting was established, the concept of ‘Summer Camp’ has been central to the programme of most successful Scout Troops, with variations on the theme for the various other programme sections too. In the early days, adults (males, naturally) took the young people (also male, naturally) away for a week or two on ‘summer camp’. A campsite or a field. Near to home or somewhere else in the country. Tents, pioneering, camp fires, pots of stew, etc. By the 1970’s women were starting to appear too – often the wives and partners of scouters, later as scouters in their own right. By the late 1980’s young members of both genders were also enjoying summer camp each year, with solutions to the ‘mixed gender patrol’ varying from shared, compartmentalized tents to separate accommodation entirely. As time has marched on however, Summer Camps have become shorter, less frequent, less common and less traditional. The days of a bunch of adults taking two weeks off (roughly half their holidays for the entire year) in order to look after other people’s children in Ireland or abroad are numbered. The ‘Health & Safety’ daleks, in their quest to kill off volunteering generally have undoubtedly played a part in successfully putting some scouters off the idea of travelling away for an extended period with a large number of young people, plus axes, gas canisters, ropes, wooden poles, saws, etc., But this is just one factor of many that is driving a decline in the traditional summer camp. In Ireland, the typical annual holidays for a private sector worker is around twenty days, or four weeks. Public sector workers get a little more. Long serving and senior people also tend to do better, but holidays are at a premium. The baby boom that the recession has generated (what else was one to do on those long, boring, money devoid evenings…?) has taken a large chunk of the population away from volunteering, as they tend to their own homegrown young. At the same time, unsustainably high tax levels have driven a considerable number of empty nesters out of the jurisdiction, whilst high unemployment and a lack of high quality jobs, coupled with opportunities abroad have eroded the numbers of 20 and 30-somethings, traditionally making up a significant percentage of active scouters. There are less active scouters with the sort of time available to devote to a project the size of Summer Camp in many groups. 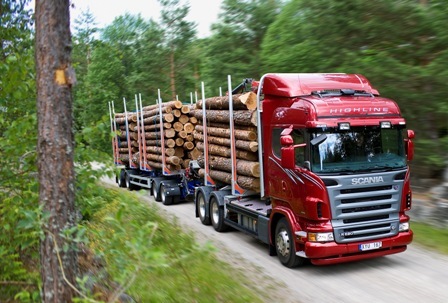 Scania R 620 6×4 Highline timber truck with trailer. The logistics of managing a traditional style summer camp can be immensely complex, before participants are even taken into consideration. Equipment can be bulky and when the numbers of participants are large, the volume and weight becomes very big, very quickly. 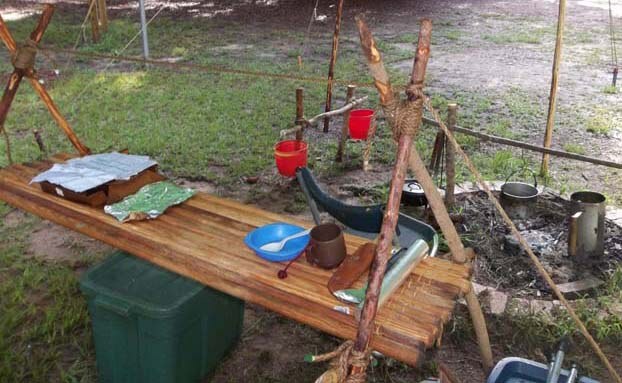 Tents, poles, groundsheets, stoves, cooking utensils, patrol boxes, first aid kits, sisal, lanterns, boundary poles, spars or staves, fire-building equipment, flags, axes, saws…. The list is rarely exhaustive (but usually exhausting). Hauling all of this equipment out of the store room, examining it to ensure all the parts are in place (yes, of course this was done during the annual inventory check, but there is never a 100% guarantee that something has not gotten mis-packed in the interim and finding this out on a campsite in Central France after a 24 hour trip, under cover of darkness, in light rain, is always best avoided). Packing it by patrol, identifying what will fit in the coach, train, plane, on the boat, in the van, truck, cars, etc.….. All this takes an inordinate amount of time, labour and effort. No matter how skilled the PL team, how organized the Quartermaster, how passionate the Scouter team, summer camp is a major undertaking, before it even starts! A teenage Irish Scouter struggled manfully with an Icelandic tent (and a rucksack) through the London Underground one Monday morning at 7am (just in time for rush hour). Several years later, he argued against bringing “that” large patrol box on camp to France (and lost the argument) only to witness the spectacle of it being hauled onto and off a TGV and later up and down escalators, on and off trains several times in the Paris Metro, along with half a tonne of other gear (and forty scouts)…. A traditional Summer Camp, where the troop is in patrols that are a close as possible to the natural patrols they are in at home, requires careful planning on the personnel front too. How to plug gaps in the patrol (where the odd member of a natural patrol is not present for camp), are all the Patrol Leaders up to the challenge, how ready are the APL’s, what about accommodation for both genders? Different troops manage this requirement in different ways, but it requires thought in order to get the optimum balance between appropriate privacy for all members, whilst working to preserve the balance of the team spirit within the patrol, in this wider context. Does the troop have a system (like the Court of Honour) in place and will the COH sit on matters that might arise whilst way on camp? What are the implications of this and how might the composition of a COH be constructed to ensure it does not impact on the wider relationships in the troop, given that being away as a team is a lot more tight knit than a typical Tuesday evening in the den? An army, it is often said, marches on its stomach. A troop is little different in this regard. Managing large amounts of food for a troop of forty to fifty people in hot weather at home or abroad and ensuring regular supplies of it to the site to ensure freshness, is a major undertaking in itself. Usually one or two Scouters, together with Quartermasters from each patrol, need to make regular visits to a nearby supermarket (or arrange deliveries). The patrol cook needs to plan meals around programme, whilst also managing a supply of clean utensils, a clean and safe environment for food preparation and the careful storage of unused foodstuffs. There is nothing to beat the smell of campfire. A waft of it anywhere in the world and one is instantly transported back to a flood of camping memories.. A summer’s night in Larch hill, late night story telling in Lough Dan, a particularly memorable summer camp abroad.. Cooking by campfire however is increasingly difficult to do in Europe, including Ireland, with cooking fuel (wood) less easy to get hold of and many campsites not set up to manage open fires. This means turning to gas stoves and other cooking methods that offer a sometimes more consistent source of energy, but bring challenges of their own including ensuring a supply of gas, its correct and safe storage when not in use, regular cleaning of the stove and having a contingency plan for when (inevitably) one patrol’s stove stops working at a critical moment. Food is important of course but the cornerstone of the Summer Camp and indeed often the definitive means by which to provide great experiences and lasting memories is the programme plan itself. This will usually be a mix of troop-run activities on-site, other activities provided by the campsite or nearby centres (archery, swimming, cycling, etc.) and of course visits to different destinations locally to hike, abseil, canoe, visit cultural attractions and of course to do some pottering around the local town or city. Programme planning is often relatively straightforward in strategic terms (what do the PLC want and when), but the detail can take a lot of time and requires coordination between the various PL’s and Scouters who undertake it. Where Summer Camp is to a foreign country, its all the more complex, especially where there is a language difference. Budgets need to be calibrated to allow for occasional losses in translation (e.g. ; €5 per hour for bike hire in the nearby village, in reality becomes “there are five bikes available”). Making the programme happen is usually fairly straightforward too, but does require focus to ensure everyone is ready for the bus, has the right gear, goes to the right place, etc., etc. When all of this work is considered and the prospect of two weeks holidays from the meagre annual leave workers receive is taken into account, it is perhaps not surprising that Summer Camps in the traditional mould, are rapidly becoming a thing of the past in most scout groups. Pairing off with a foreign group can be a way to save a lot of work, by travelling to their area, borrowing some of their equipment and tapping into their local knowledge. This helps some groups with resource allocation in a way that makes a summer camp easier to arrange, a lot more portable in logistical terms and overall much more feasible. Increasing numbers of groups are also utilizing the services of not for profit entities that own properties across Europe and will provide food, accommodation, programme options and transport for an all-in fee per person. This solution typically elicits a sniffy response from those traditional groups who do not consider anything not under canvas to be a summer camp and who in any event have a sneaking suspicion that volunteer scouters who engage in this sort of behavior are in fact not really scouters, nor do they run scout groups but rather glorified youth clubs out in the suburbs, far (thankfully) from the ‘proper’ scout groups. Whilst these scout snobs do have a point to a degree (is it really a ‘camp’ if you’re in a dormitory? ), the reality of delivering scouting in 21st century Ireland is that scouters need to work with what is available and use it to provide the best possible programme and the best possible experiences. The Irish Scouter cannot claim the pedigree of a traditional scout group, but within his own group has on many occasions camped for ten days under canvas on what might be credibly described as a ‘traditional’ summer camp. Equally, he has sampled the overseas ‘package’ summer camp (sleeping indoors on a few, but also camping out). Its reasonable to say that even with a ‘package’ arrangement, the Patrol Leader and Scouter teams still have a large amount of work to do in advance of, during and after the event. A well-organised trip, using a not-for-profit entity does make choosing a destination easy, but it needs to be decided upon at an early stage (the various venues book up quickly). Food is provided so menu is a lot more straightforward. But whilst programme is on offer, the team will need to decide on the options, ensure they fit the group (or work out shift arrangements), manage the available budget and sell the programme to the wider troop. Equipment is often provided or can be hired locally (for example, bikes, climbing gear) and kitchen equipment is in the house where the group will sleep. The ‘package’ summer camp is not quite the same as building an entire site from scratch in a field. That is a unique experience in itself. A ‘package’ camp is different. It offers great opportunities to see parts of Europe that would be less accessible for most groups seeking to camp in the traditional way, if only for reasons of simple logistics. Every troop (and every Cub pack, Venture group, Rover crew) should aspire to run a ‘summer camp’ and if not possible every year, then perhaps every second year. On the alternate year, a ‘package’ camp, if it means the difference between going away as a group or not doing so, should not be dismissed out of hand. Camp craft skills (a skillset that is dying off alarmingly fast in a large number of groups) wont get tested on a package trip, but all the other facets of a patrol system function perfectly well – meals and cleaning rota’s, team-building, inter-patrol competitions, unique experiences and fabulous memories, the forging of lasting friendships. Not all scout groups can meet the high standards of the few. This will rarely be for want of trying, but sometimes work, family and other commitments get in the way for some scouters, who are passionate about scouting, love their involvement but for whom Scouting is a hobby, not necessarily an all-consuming obsession. If one needs the latter level of devotion in order to deliver Scouting in the way Baden Powell set out, then perhaps it is time to recognize that times have changed. It is quite likely the great man, if setting out today to found Scouting, would not be setting unrealistic expectations. 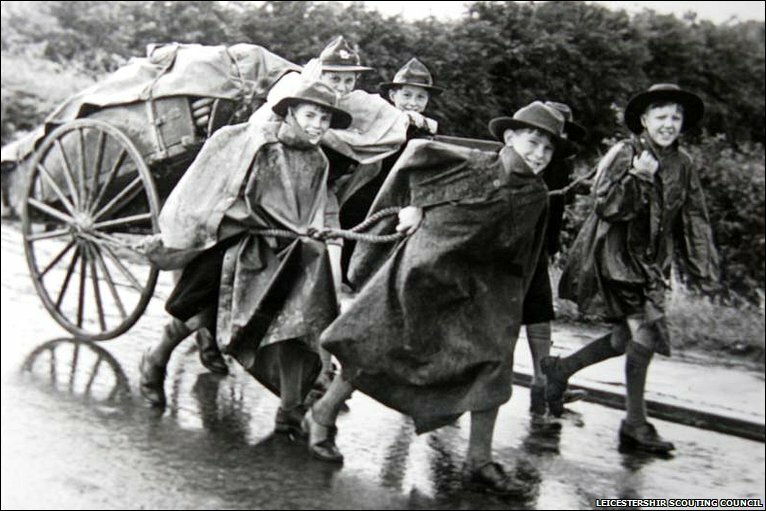 A century ago, Summer Camps were a lot more local and the World was a very different place. Young people and their aspirations have changed too. Baden Powell wanted Scouting to be open to all, he did not want an exclusive club just for the ‘eat, drink, sleep’ type of member. When the Irish Scouter talks to Rover Scouts and Scouters about childhood and teenage memories of Summer Camps, the highlights come from several, not just one single event. Few wax lyrical about the number of square lashings they tied. Fewer still drool over the number of pots and pans dragged for days over rough ground to reach a campsite.. The common thread is the friendships gained and the fun experienced… a night around a campfire in Guernsey, getting temporarily lost in Prague, a midnight walk in the Massif Central, a stroll along a lonely road in Kerry, that thunder storm in Larch hill…. Scouting has fundamentals and so it should. Camping is still a favoured pursuit for scouts. But in the final analysis, ‘time away together’ seems to be what floats most scout’s boats. It possibly matters less if the sleeping happens under canvas or slate. I think there is a great deal of “pandering” and competing with the joneses (or the 25th) in some of the camp planning. Sure the package camps have something to offer and it is not all Hi De Hi and full butler service but a “proper” camp on a modest scale with “scouting” as the programme are far better for developing the self-reliance/inter-dependence mix which is central, and unique, to scouting if it can be undertaken at all. If scouters are short of time a long weekend or two not terribly far away has a huge amount going for it. If scouting is the camp programme there is less of a need for the expense of buying in equipment and expertise for entertainment. These camps are less demanding on the members finances, less demanding on the scouters time, energy and patience and such camps are infinitely scalable. I have had such camps with six 12 year olds and with 90 12-17 year olds. The patrol system works. Traditional scouting works. The way to compete with playstations and a home life which is an endless round of organised activitiesis not to be more playstationy, more organised activitiesy, the way to compete is to be different. We do not have to be bound to Icelandics to camp though. It is still possible to have the scouting experience in bricks and mortar or log cabins or whatever, the key is the programme which should allow plenty of time for not having to do stuff (but maybe still needing to, like hauling firewood, water and groceries). That’s life. What BP envisaged and put into practice 100 odd (and some were very odd) years ago was as different from the home life of kids then as it is from their home life now. If you are old enough you may remember the Scatman, “I want to be a human being, not a human doing” and that is what traditional camp has to offer. They can and should camp alone some of the time. I have recently moved from scouting Ireland to Scouting Scotland . My groups summer camp this year was a traditional green site camp . The site was a field next to a river on a private estate . It had been over 24 years since I’d experanced this before. The programme was all based around the patrol working together , and learning the skills they needed . It was not a camp where by kids are looking to be entertained . This is the problem at home , summer camp is a) being used as the leaders holiday b) entertainment for scouts in summer. Whilst this camp was only 5 nights this was enough when older members also enjoyed it . It doesn’t need to be a long haul of a camp . Secondly camp was only held 1 hour down the road but this was enough. I think groups need to look at what they use summer camp for ….